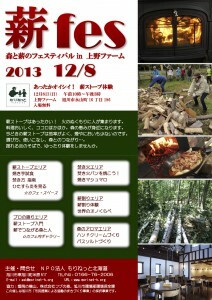 Forest and firewood festival in Ueno Farm held! We will do events at Ueno Farm where you can experience the goodness of the wood stove that has been drawing attention in recent years! On the day you can listen to How to choose the wood stove such as how to choose a wood stove and how to use it from a professional in the cafe, or you can make a baked sweet with a wood stove and a wood stove to taste it! ! ◎ Please see here for detailed content and time schedule of the day.